© 1987. Published by Association for Computing Machinery. ISBN 0-89791-213-6. 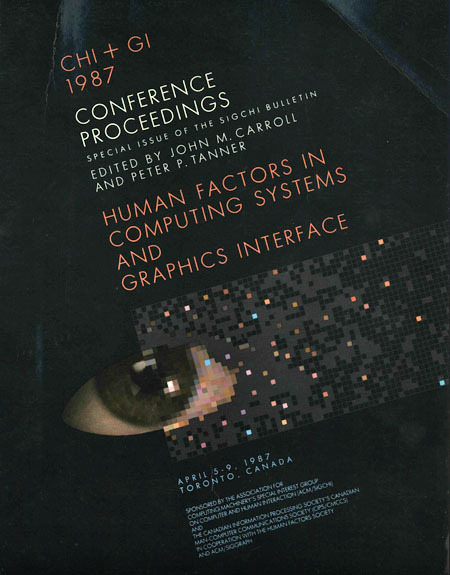 The 1987 conference was a joint undertaking of two annual conferences – CHI’87 (Human Factors in Computing Systems), and Gl’87 (Graphics Interface). The CHI conferences have traditionally been concerned with many areas affecting human-computer interaction, including diverse aspects of computer graphics. Graphics Interface is a computer graphics conference with a tradition of concern for human-computer interaction and user interface design. The synergy of this pairing, especially evident in the papers on user interface management systems and graphics interfaces for information systems, afforded a unique opportunity to expand the scope of considerations of how better to present and accept information for human users. Computer-supported cooperative work (panel): is this REALLY a new field of research?